Dan LeFevour has something to prove with the Montreal Alouettes. The six-foot-three, 230-pound free-agent quarterback signed a one-year deal Wednesday. LeFevour spent three seasons with the Hamilton Tiger-Cats but his '14 campaign ended Aug. 16 when he suffered a torn left anterior cruciate ligament in a 30-20 loss to the Calgary Stampeders. "Just me coming back and wanting to play football this year proves the fact that I want to prove something," LeFevour, who became a free agent earlier this month, said during a conference call. "My knee is doing great . . . I'm driving back and I'm throwing, I'm running and cutting, accelerating and decelerating and changing directions right now in my rehab every day. "Now, it's not 100 per cent but it's probably 80-to-90 per cent right now. It's something I've been able to push cautiously and progress at a pretty steady pace without getting too stupid with it. Everything is going well to this point and I don't see why that would change." Montreal also signed free-agent slotback Nik Lewis to a one-year deal. Lewis, 32, spent his first 11 seasons with Calgary, registering 805 catches for 11,250 yards and 65 TDs while winning two Grey Cups ('08, '14). LeFevour backed up veteran Henry Burris his first two seasons in Hamilton before playing behind newcomer Zach Collaros last year. LeFevour became the starter after Collaros (concussion-like symptoms) was injured but Collaros returned under centre the game after LeFevour was hurt and led the Ticats to a second straight Grey Cup appearance. LeFevour will be a backup again when Montreal opens camp. Jonathan Crompton is the starter after guiding the Alouettes to an 8-2 late-season record and 50-17 East Division semifinal decision over B.C. before the club's season-ending 40-24 road loss to Hamilton in the conference final. "Jonathan Crompton was the starter last year, he led them to the Eastern final and he's the starter heading into (this) year," LeFevour said. "I'm just going in to compete and do the best I can to add to that quarterback room and that franchise." Montreal has five quarterbacks under contract with Crompton, LeFevour, veteran Tanner Marsh, former NFLer John Skelton and sophomore Jerrod Johnson. The club expects to reduce that number to four once camp opens. Despite his impressive record, Crompton had a 58.1 completion percentage for 2,482 yards with 11 TDs and eight interceptions. Montreal's offence averaged 20 points per game, second-fewest in the CFL. "It's (Crompton's) job to lose," Montreal GM Jim Popp said. "But I've said this for two years, we've got to be better than what we are. "We did get on a good win streak last year . . . but it wasn't like we were scoring a lot of points a lot of times. Somebody has to step up and get it done, not just from the quarterback position but all positions, for us to be as good as we can be." LeFevour, 27, was a dual threat in Hamilton. The former Central Michigan star completed 141-of-211 passes (66.8 per cent) for 1,670 yards with five touchdowns while rushing for 631 yards (6.1-yard average) and scoring 11 TDs. Montreal offensive co-ordinator Turk Schonert wants to utilize his quarterbacks' mobility in 2015. "In this league I think quarterbacks have to have some mobility," he said. "We're looking to get out of the pocket a little bit more than we did last year and that favours Dan because he's very good at that. "I think it's going to favour and help Jonathan as well as Tanner because he can get out of the pocket. I don't know about John Skelton yet, I'm looking forward to finding out about him and he's going to have to favour that kind of offence as well." LeFevour threw for 12,905 yards and 102 TDs while running for 2,948 yards and scoring 47 touchdowns at Central Michigan. He went in the sixth round, No. 181 overall, of the 2010 NFL draft to Chicago and also played for Cincinnati, Indianapolis and Jacksonville before joining Hamilton. And although Hamilton signed Collaros as a free agent to succeed Burris as its starter following the '13 season, LeFevour harbours no resentment towards his former club. "He (head coach/GM Kent Austin) wasn't shy to use a second-year quarterback and kind of mix it up with a potential future Hall-of-Famer in Henry Burris," LeFevour said. 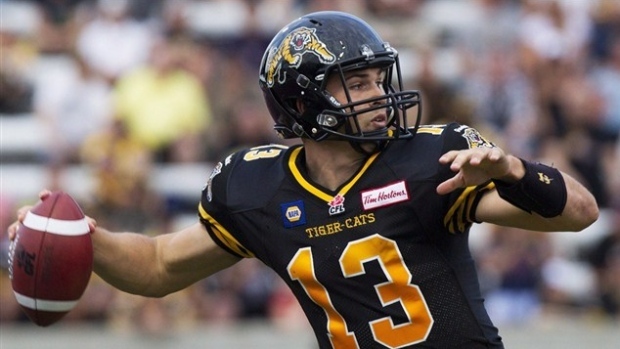 "I can't thank them (Ticats) enough for what they've done for my career."